Last year, an estimated 5,000 people were on Ezra Avenue in mid-afternoon, but this year, the numbers have more than doubled. 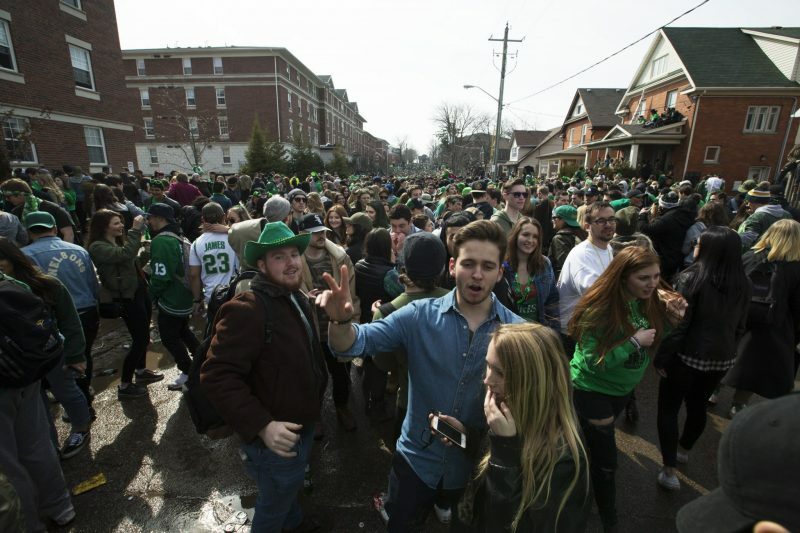 According to The Record, an estimated 12,000 people have joined the crowd on Ezra Avenue to celebrate St. Patrick’s Day. Right before noon, Ezra appeared to be quieter than usual. “We have a significant operational plan in place, we’re approaching noon and we’ve been at this since about 7:00 this morning, being very proactive, engaging, making sure that we connect. We have cross-functional teams, regional paramedics, City of Waterloo fire, City of Waterloo bylaw,” said Bryan Larkin, chief of the Waterloo Regional Police Service. By mid-afternoon, the crowd had allegedly reached over 10,000 people. “We have a good relationship with our student unions and the universities. Obviously we have a couple of hot spots to make sure we’re focusing our attention on, to make sure there’s public safety. One of the things we worry about is binge drinking because it can lead to other significant issues. We worry about sexual assault and those types of things,” Larkin said. Earlier in the day, a Ride Program was set up on the intersection of King Street and Ezra Avenue to ensure that no one in that area was drinking and driving. Larkin explained that every March 17 there are several Ride Programs, but they decided to move one closer to Ezra Avenue this year to send a strong message. Several ambulances were seen throughout the day assisting partiers that needed medical attention. Last year, WRPS reported that they laid 256 charges, about half of those were due to open alcohol. On Saturday morning, EcoHawks student group will be leading a neighbourhood clean-up at 10:30 a.m.